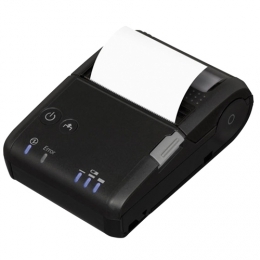 The Epson TM-P20 is a compact 2 direct thermal mobile printer for easy printing from a smartphone or tablet - optimal for usage in retail, hospitality and everywhere where on-demand mobile receipt printing is needed. The printer supports NFC, plus optionally Bluetooth 3.0 or Wi-Fi 802.11 b/g/n 2.4 GHz/802.11 a/n 5 GHz. This way, you connect it easily with every handheld or smart device. This greatly simplifies integration into existing systems. With its compact size of 79 x 120 x 44 mm and a weight of a mere 228 g, users carry the printer comfortably with them. With the optional protective cover the printer is IP54-certified and withstands multiple drops from heights of 1.5 m. The TM-P20 prints with a speed of up to 100 mm/second. Thanks to its paper saving function it saves up to 23 on consumables, lowering operating costs. The printer operates up to 8 hours on one battery charge Bluetooth, respectively 6 hours Wi-Fi.